Arts Night is a labor of love. Love of our school and our students and their talents are what drive us to work for months to create this one special evening each December. Everyone, from the teachers, Chairs and volunteers, to our staff and maintenance team is part of this effort. Saturday evening’s “View of the City” was no different. 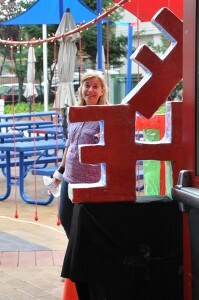 Arts Night Chair Terri Kalia setting up on Saturday morning. Throughout the morning, a team of volunteers led by Arts Night Chair Terri Kalia, polished off last minute details inside the campus and assembled the stunning entryway outside beneath treacherous grey skies. Thanks to the handiwork of Rebecca Geraldi and Carolyn Lott, along with assistance from our maintenance team and some handy parents, a bridge was built in a day – the Golden Gate Bridge no less! 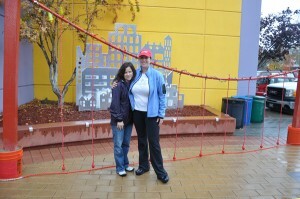 Golden Gate Bridge designers Rebecca and Carolyn. The talents of Gary Meeker ensured ISTP’s Golden Gate Bridge was an illuminated beacon to the parents and students who braved the rain to enjoy Arts Night. 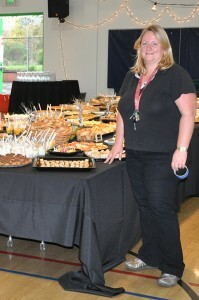 As nails were hammered and lights were hung, a stellar culinary team dutifully prepared the gourmet buffet. Food Chair Leslie Desaeyere and her dedicated volunteers spent hours slicing, spreading, heating, and dividing to create endless platters of sweet and savory foods. Food Chair Leslie Desaeyere shows off the gourmet buffet. Once we reached 4 p.m. and the Cowper families entered the Cohn Campus, the vision of Art Teachers Aïcha Idelcadi and Haiying Yang was complete. 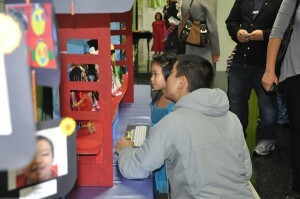 Every project and piece of art was an interpretation of the theme “View of the City." Aïcha and Haiying supplied knowledge, tools, and ideas, and then let students’ imaginations and creativity soar. 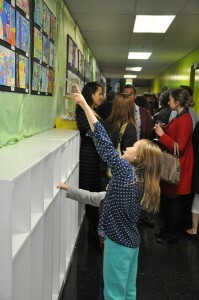 As always, it was amazing to see the work created by our youngest artists – the Cowper students. Cowper teachers find projects within the theme that allow their students to create something of their own, and it never ceases to amaze me how creative and talented these young children are. Students show off their artwork during Cohn Viewing. The evening was the backdrop for many memorable moments, but I did witness a true rarity. The buzzing crowd of the MPR came to a halt when the 8th grade video “The Art of Hip Hop Dance” (directed by Aïcha Idelcadi with assistance from Tara Speed) played on the wall. The silence of the crowd was distinct as the music filled the room and 8th graders dazzled us with an inspiring display of Hip Hop dance. I even spied Middle Schoolers peeking down into the MPR from upstairs – all trying to catch a glimpse of the film. As the evening came to a close and people departed, the task of cleaning up was at hand. I cannot say thank you enough to everyone who stayed until 10 pm (and later) to help clear away our makeshift art gallery. As I locked the doors to the school, I thought about all the hours of work that went into this one evening, and not just from the volunteers and teachers. I thought about the many hours each student commits to Arts Night. There is precision, passion, and (most importantly) love in each piece of art displayed. You can feel that extra bit of dedication and desire to get something “just right." It is something I witnessed first hand early in my career when working with kindergartners. Even at that young age, we have a vision and a desire to see the vision in our head come alive in our hands. Thank you to all our students and teachers for sharing their artistic visions with us, and to everyone who helped make those visions come to life. Cowper families excitedly view artwork.